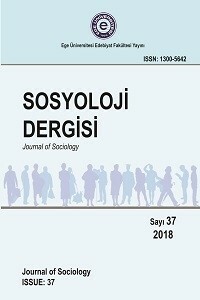 Giving the priority to the one written in the original language of the article, “Title/Abstract/Keywords” and “Makale adı/Öz/Anahtar Kelimeler” should be sequentially added. Abstract and keywords should not exceed 250 and 6 words, respectively. Texts should be written utilizing Arial 10 pt in font type, 1,15 cm in line spacing and before 6 nk, after 6 nk in paragraph spacing. Pages should be structured as A4 with the customized values of 16,5 cm in width and 24 cm in length. Page margins should be arranged cropping 3 cm from top, 2,3 cm from bottom and 2 cm both from right and left. Text’s length should not get beyond the limits of 10-25 pages. SURNAME, N., YEAR, Book Title. Place of Publication: Name of the Publisher. SURNAME, N., SURNAME, N., YEAR, Book Title, Place of Publication: Name of the Publisher. SURNAME, N., YEAR, “Chapter Title” Book Title (in) SURNAME, N. (Ed.) Place of Publication: Name of the Publisher. SURNAME, N., YEAR, “Title” Journal, Vol: No: pp. SURNAME, N., YEAR, “Paper Title”, Conference Name, Year, Place, Issuing Institution Place of Publication: Name of the Publisher. Programme Name, YEAR, [TV programme] TV Channel, Date Day/Month/Time. ie. Little Britain, 2006. [TV programme] BBC, BBC2, 30 January, 20:00. Movie Name, YEAR, [Movie] Director, Country: Production co.
SURNAME, N, YEAR, “Article Title”, Journal Name, Volume, page line, Citation date, Database name. ie. Tamney, J. T., (1993). “Conservative Government and Support for the Religious Institution: Religious Education in English Schools”, The British Journal of Sociology, 195-210, October 23, 2000, JStor Database.